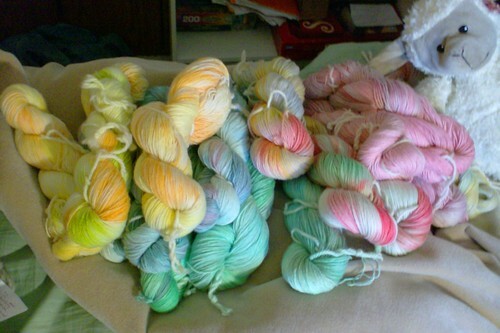 Last week, my sock yarn arrived! I was afraid it wouldn't arrive in time for spring break, because I had it sent to my home address in Cincinnati so I could dye it up at home (where I have a full kitchen and large microwave). But on Friday I had a large squishy package from Australia waiting for me. Boy was I thrilled. I did not hesitate to get to work. Those are my first two attempts, in the microwave. One is orange, yellow, and green, which I had been planning for a while - 'Daffodils'. The second is sky blue with a splash of red, which I haven't been able to come up with a suitable name for yet. The boy picked out the colors and it came out nice. I also tried a new method of dyeing, in the oven in a casserole dish. 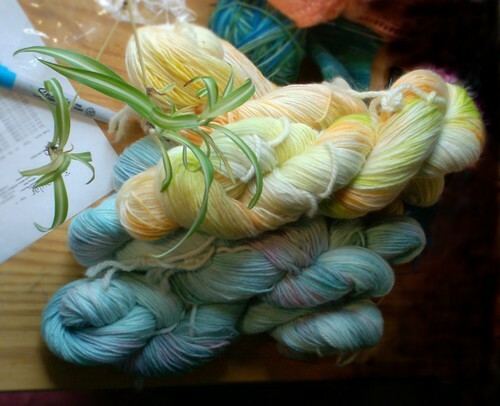 This allows me a little more control about where my colors go than my previous method, so I can come up with some really funky variegated yarns. 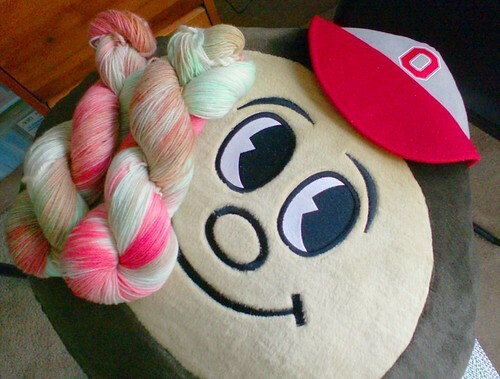 My first try was this Ohio State University yarn, which I am calling 'Buckeyed'. I am listing the yarns as fast as I can, though this is the first week of a new quarter so I'm busy with classes (sadly!). 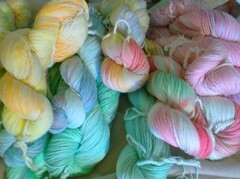 But, the full offerings of what I've listed so far can be found here, in the 'I dyed yarn' section of my shop. Once I am through listing the sock yarns, I am going to work on patterns! I've had some interest in patterns for my sachets and limes, so once I write those up I will be selling them through Etsy and Ravelry. Also, stay tuned for a free pattern here on the blog soon! Wow I love your yarn, very pretty! Oooo wow those colors are gorgeous! You have a great eye for color! Makes me want to get more yarn.. ooooo I love yarn. I haven't been knitting lately tho! I have to finish the socks I'm doing before I can buy more yarn!